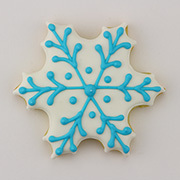 This is our top selling Snowflake Cookie Cutter, ideal for a holiday party- or any other winter occasion! Also a good shape to use for a "Frozen" themed birthday party. 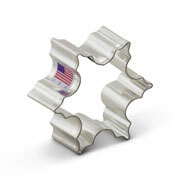 It measures 3 1/2" and could also be used for cutting other soft foods. 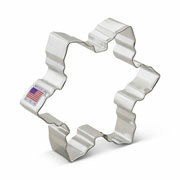 The snowflake cookie cutters were purchased to carry out the birthday theme for my precious granddaughter's 1st birthday. They were the perfect size. 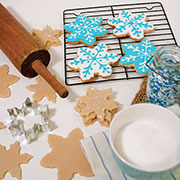 I used this for Christmas cookies this year and LOVED the result! 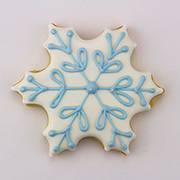 Great design that was easy to decorate and looked beautiful with only a simple icing design. 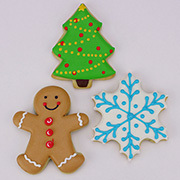 These are nice left plain but beautiful decorated, even with just a few dots of white icing. A lovely shape that I'll use all winter.